So at the end of our previous post, I said that we would be traveling a very short distance from Rainbow Plantation to our next destination. When I said short, I meant short, like about 20 miles to Gulf State Park in Gulf Shores, AL. It should have been easy peasy, right? Wrong! 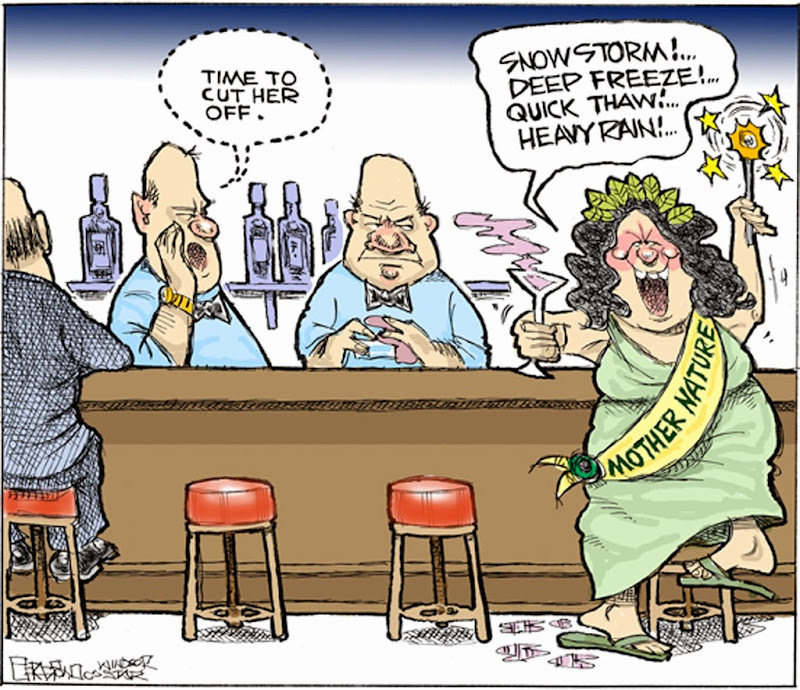 Mother Nature decided to show her nasty disposition that day. When we awoke Sunday morning, it was raining, well, no, it was pouring, actually it was torrential downpours with thunder and a light show! Rob’s phone was beeping every few minutes….warning, warning tornado watch….warning, warning flash flood watch….warning, warning severe thunderstorm watch. One right after the other! Well, isn’t that just hunky dory! Just what you want on the day you have to move even if it is just a hop, skip and a jump away! Actually you don’t want any of that even if you are parked! Since checkout was at noon and there wasn’t a glimmer of hope that it would clear by then, I called the office to see if it would be okay if we stayed past checkout. If it wasn’t we would need to leave and find someplace to park to wait it out. But thankfully the woman in the office said it was okay for us to stay. So we waited and waited and waited some more! The hours ticked by…11am…noon….1pm… Sigh, maybe we’d have to stay here all day! Finally about 2 pm the rain began to ease off and the worst of the tornado warnings had passed. Luckily after listening to the forecast, the day before Rob had picked up the outside rug, put away the bikes and did everything he could in prep for our departure, but still he had to unhook everything before we left. Good thing because our site was pretty flooded and the coach was slathered with live oak leaves. 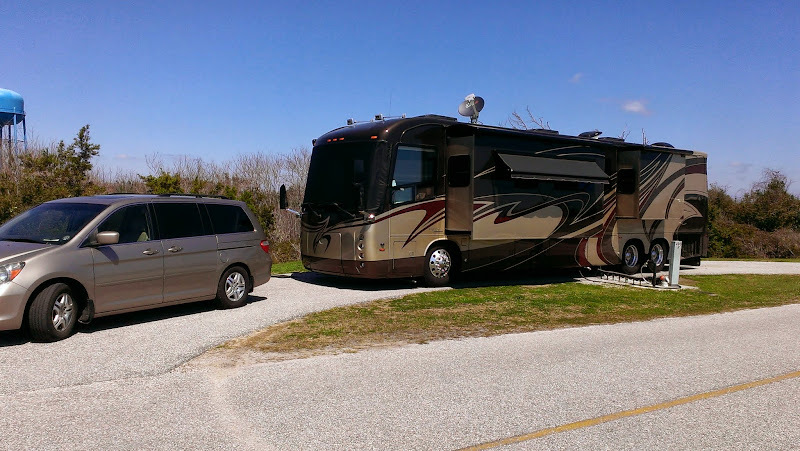 After pulling out, we stopped along the side of the campground road to hitch up the toad, then off we went headed to Gulf Shores. Despite the showers and the threat of flash flooding, the drive was uneventful. Having to sit at Rainbow Plantation did have its advantages though since check in at Gulf State Park technically wasn’t until 4 pm. 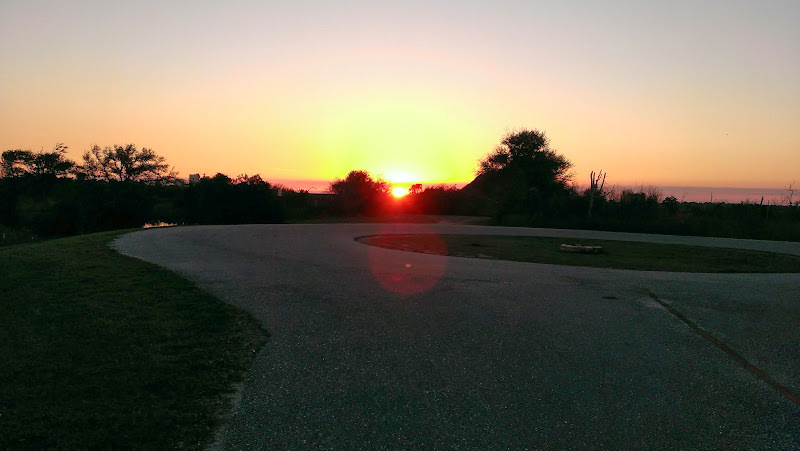 We stayed at Gulf state Park in 2012 and loved it! 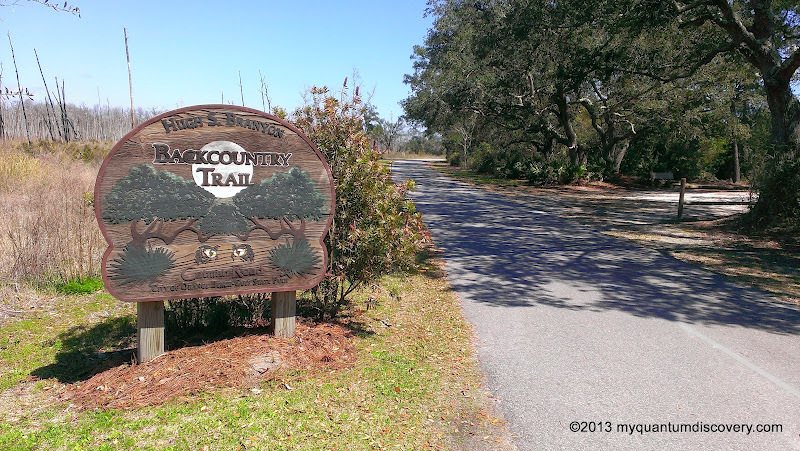 So close to everything – the beaches, the 11 miles of paved Hugh S. Branyon Backcountry Trails for biking and walking, a variety of restaurants, shopping, Pensacola NAS Museum, Mobile and the USS Alabama battleship, Fairhope and lots of other places so there’s always something to do. But when you are inside the park and just want to relax, it feels like you are miles from all the hubbub. 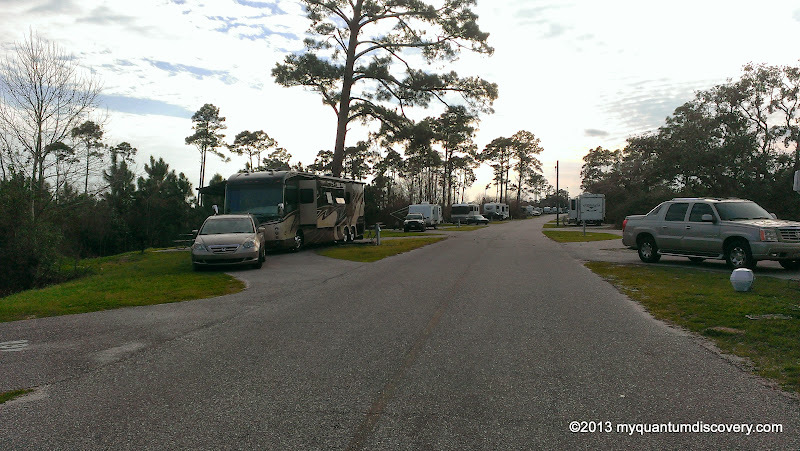 Gulf State Park campground is huge with 496 paved sites (a combination of both back in and pull through), but is laid out along the length of Middle Lake and the canal to Shelby Lake making it very long and relatively narrow. 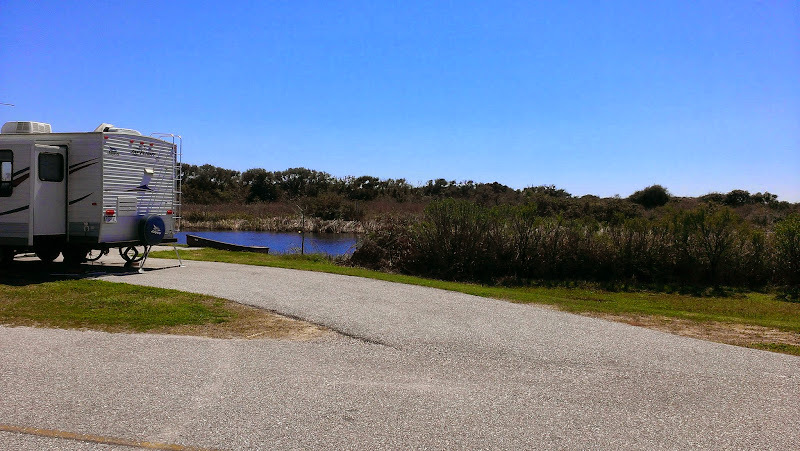 In fact, our site was located at the far western end of the campground – it was a 2 mile ride to get to the eastern end of the park and another 1/2 mile to the intersection of the official bike trails. Each site has water, 20/30/50 electrical service and sewer, a picnic table and pedestal grill. There is WiFi distributed throughout the park but it is almost always fully saturated and not very useable, most of the time we weren’t even able to get an IP address despite a decent signal – the state park has been seeking a solution that fits within its budget for a few years now but due to the size and robustness of the system required it hasn’t happened yet. Other amenities include 11 bathhouses, laundry facilities, 2 playgrounds, a comprehensive Nature Center staffed by very friendly and knowledgeable rangers and volunteers, a swimming pool (it wasn’t open due to the cold temps), a boat ramp, a store, several hiking trails and an outside amphitheater and lots of activities! From March 1st to Novembers 1st, the rate is $31/night M-Thurs and $34/night on weekends. There is a 15% discount if you are over 62. Unlike most state parks, Gulf State Park does allow monthly stays between November and March but the rest of the year the stays are limited to 14 days (at least officially), cost ranges from $400-$600 depending on location (waterfront is highest) and includes electricity. The park is almost always full during the winter months so advance reservations are an absolute must! Once we arrived, we checked in at the office where we were assigned to pull thru site #490 on Live Oaks Drive. Although the site wasn’t right on the canal, we still had a pretty good view of it from across the street. Plus being at the far end of the campground, it was pretty quiet without a lot of traffic driving by. The other advantage was that it was just a short walk along State Park Road 2 to the beach. And being at the western end, we saw some beautiful sunsets! Unlike some other state parks with pull thru sites laid out parallel to the road in a small “loop”, the pull thru sites here are plenty big and easy to maneuver in and out of even for our beast. And besides nearby alligators our site also came equipped with our very own swamp rabbit! Late in the afternoon, out he would come to chomp on the grass next to the beast – he didn’t even seem to mind us being there. Our original plan was to stay from the 16th to the 22nd, leaving on the 23rd but we were enjoying our stay so much that we called to extend our stay. The campground was so full that I didn’t think we would be able to get a reservation but amazingly they had one site left on Raccoon Road (the main road in the campground) for 3 nights. The down side is that we had to move – which of course is a pain. They have some type of screwy system there (only understood by the staff and even that seems questionable because the clerk couldn’t really explain it either). It appears that reservations can be made for a certain roads (but not a site), which partially explains why we had to move. However, certain roads are designated for long (?) term rentals while others are for short term stays so the road/site you are assigned is based on the length of your stay – well, maybe!? Someday perhaps we’ll figure it out. So on the morning of the 23rd, we drove down Raccoon Road in the van, making a note of the empty sites that we liked, then went to the office to check out of #490 and check in to a new site. One of the pull thru sites that we wanted was available – site #466, located at the opposite end of the campground (2 miles from site #490) right near the bike trail entrance, thus eliminating the additional 4 miles we had to pedal back and forth from the trail each time we rolled out on the bikes. It took us about an hour to pack up, unhook the utilities, bring in the slides and drive to the new site, then do it all again in reverse. We did have an issue with our DISH Network satellite reception on the new site due to more trees nearby, but managed to resolve it by switching from the Western Arc to the Eastern Arc. 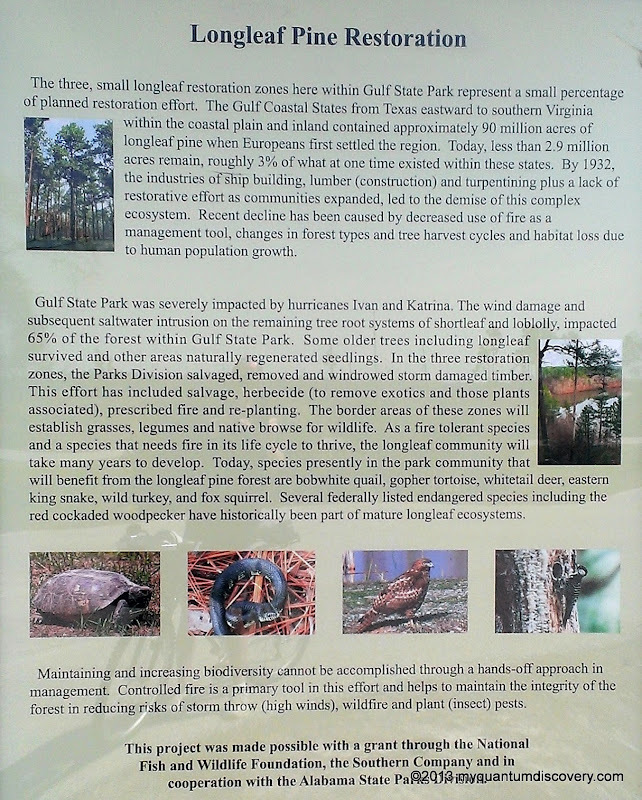 More about our adventures at Gulf State Park later! You’ll absolutely love San Antonio if you go! We used to drive up from Houston for the weekend. The Texas Hill Country is beautiful, too! Lots of wildflowers blooming in April and May. The hubby’s family (mother’s side) is originally from Alabama, just east of Birmingham, a little town called Lincoln. Thanks for your comments. We really wanted to go to San Antonio but unfortunately we’ve decided that we won’t have time this year since we need to be back to RI by a week or two before QL gets launched on May 21st. But there’s always next year. We’re a little behind on our posts so we have already left the Gulf Shores area. But we did go to the Gulf Restaurant which we’ll talk about in our next post. Neat place, awesome view! Didn’t try the burgers – had the grouper sandwich instead. Guess that gives us a reason to go back next year!